Lalu Prasad Yadav is one such person who believes in himself and the way he leads his life is just the reflection of thwarting people’s opinions and originality. His sense of humor, his dialect , his dressing style and the way he presents himself are part of his unique persona and it clearly presents one unique individual. The one trait that is commendable is his bold and authoritative expressions. The connect that he has with people makes him a people’s person. The image of a common man that he is which makes him instantly touch any person in the audience. His light-hearted personality, his carefree attitude and the way he is so comfortable in any scenario or place just makes him a very special person. The traditional persona that he has, the attire of dhoti and kurta and the local dialect that conveys his Indianism is just marvellous. He can make any advertisement,media interview or speech a success by his jovial personality and great sense of humor. The romantic side of his can be easily stroked by just asking him about the love of his life Rabri Devi and he’ll be seen blushing in no time. The way he makes a fool of everyone including the top officials is more funny than serious. The recent incident where he made both his son contest election where the younger one and elder one’s age were goofed up in order to meet the election criteria was just hilarious. One thing, we can definitely learn from this cute personality is the lighthearted way to lead your life and never dig so deep as it can make the complicated life more complicated and troublesome. I once read a beautiful line which is totally applicable on him i.e. “Blessed are those who take troubles and struggles in life as mere tickles”. He truly follows this principle in his life and lives in present and enjoys every bit of it. 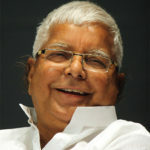 Laluji, we all love you! !